This is Mark from Vibesta and I can shed some light on this. We are the manufacturer of these arms so if you find the identical arm somewhere it is from us (or a copy of it). It is right that we produce it in china to be able to offer it at the lowest price possible and we take great care of quality control to offer arms that are of the same or better quality compared to the best arms on the market. We sell the arms to manufacturers, retailers and final customers so it is possible to get it through different sources but we try to offer Vibesta arms locally in as many countries as possible so that customers don’t have to pay high shipping costs or wait a longer time for their order – for example within the USA you can order Vibesta arms from Express35.com or Cory Easom, for europe we have local stock in Germany and we are constantly adding retailers within other countries to our network. We will very soon update our website so that it gives you more information where you can order our products locally. As prices don’t differ a lot I would encourage you to order from a local source if possible to support your local dealers and also for better and more direct customer service. Posted in canon 60d, dslr stabilizer, Equipment Reviews, Flash Photography Projects, Photography Gadgets, Videography Gadgets. 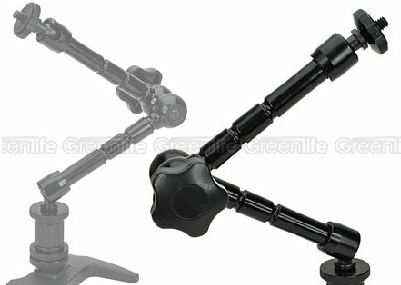 Tags: flexible arm, lcd monitor arm, magic arm, power friction arm on September 22, 2010 by Emm. looks like great quality, however.. how do you mount two of these without a very expensive cage? any tips for a hot shoe splitter? 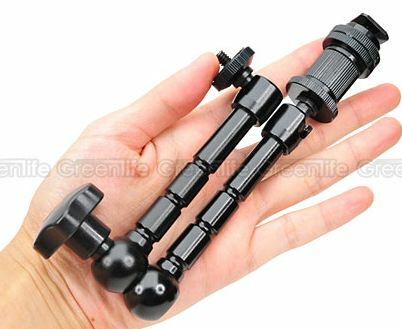 I ordered this and after just 10 minutes I managed to tighten the adapters so tight that I can't remove them. Any tips? The only thing I can do is loosen the hot-shoe screw. The other's won't turn in either direction. @Jared - Yes I was aware. 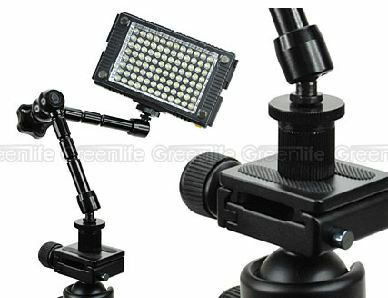 They alo use my video for the Z96 Led light they sell. Pretty cool! I'll get a couple when I'm back from vacation. They're up on eBay again! Yay! @Darin - the eBay one comes with everything. Both of mine came with the shoes, and male / female adapters. If I buy from the EBay listing in the post, is there a place to get the hot shoe adapter for it for less? From Express35, my cost with shipping is $29. The EBay seller doesn't seem to sell the adapter. I already have the hot shoe part, i just need to find the adapter piece with a female 1/4-20 thread on both ends. Not that I know of yet. I'll poke around. 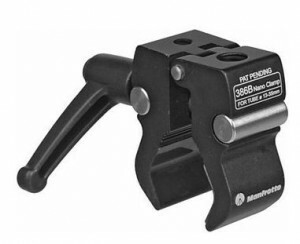 Any cheaper alternative to the mannfroto nanoclamp ? I love buying stuff via this site! Thanks for all the great finds Emm! I have used similar Noga Arms (Israeli Arm) and paid pro prices so assuming these are equivalent, it's a worthy investment at this price. Great tip. LOL. I split it because I messed up on what I was saying. Actually the camera will support SDXC with exFAT for no limit videos. For now you'll need Windows 7 for that. I am surprised how much weight those arms can take. But they seem perfect for a monitor or second cam. I have a question regarding the video shot with the 60D. I noticed you split the 4 minute video in 2. I assume the 60D has the 4 GB continuous recording limit that all DSLRs have. Have you ever heard of a firmware hack to extend the video shooting time in 1080p past the 4 gigs? Thanks! Great blog and a huge resource to anyone shooting with an HDSLR!! !